Suzette is freaking out that she is going home next week. Alec is trying to reassure her that there are many targets in the house. 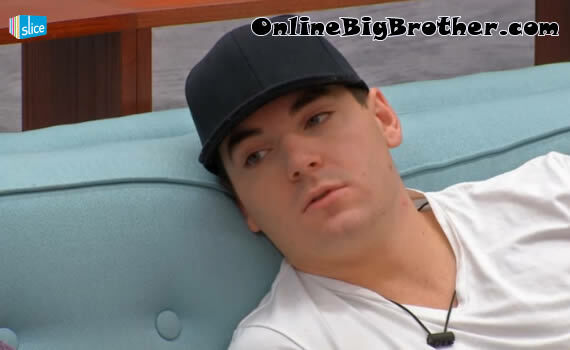 He points out that AJ is going to “talk himself out of the house” at the rate he’s going. Suzette mentions that she just wants to make it to the Jury house. Alev tells her if Emmett or Tom win HOH Suzette will be probably be nominated, he thinks he can talk them into putting Suzette up with AJ which probably means AJ goes home. They both agree that everyone likes Suzette. Alec really pushes that Tom is after her but if she does as Alec says he can help her stay in he house. 9:17AM Kitchen most houseguests milling around the kitchen getting breakfast ready. You can hear Kat in the background.. “Ya F**k you BRO.. F**k you Bro” Juat random conversations. 9:22am Bathroom Gary, Danielle and Talla Gary is saying that Danielle really knows how to dress to flatter her body. Danielle mentions that her family will not be watching the live feeds. She doesn’t really think they will be watching all the episodes either. Gary’s family will probably not watch the feeds either. Danielle: “My mom has no idea what a PVR is.. nor do it F**K it” Talk moves to bathing suits and how Danielle looks good in “60’s” styles clothes.. Cam switch to the backyard..
Kat saying that she’s been working on Alec last night. Kat goes back to coaching Aneal.. She’s acting like she has the entire house figured out. Kat is telling him to leak some information to Liza to see where it goes. She plans on dropping bombs before she leaves today. Kat: “I think you should talk to Liza let her know give it a few days see if it goes really public.. and if it doesn’t tell Tom and Emmett.. and I will say”… Talla joins them acting all upset because Andrew was giving her a hard time for being lactose intolerant. Apparently Big Brother hasn’t given them very much Milk. Aneal mentions that they haven’t been given milk for 8 days. Talla goes on and on about being lactose intolerant and how Andrew bugs her about it. Kat Leaves talla and Aneal. Aneal asks her if she wins HOH who will she will put up. Talla doesn’t know she says that most players won’t make their nominations personal like Suzette did. Aneal plans on locking himself in the HOH for 3 days if he wins HOH. Talla is worried that the groups in the house will not break up. Aneal agrees. Kat joins them t and says that the “power houses” in the game will be targeting the floaters before going after each other. Kat: “The people that are powerhouses see the floaters as threats because they don’t know what side they are on” Tom Joins them. Kat heads to the hammock. Tom asks them if the vote is going to be 12 zip against Kat. Aneal doesn’t know. Conversation moves to the comp tonight, they all agree it’s not going to be endurance. Jillian is complaining that she was called into the Diary room right after she woke up. Kat is coaching them telling them that the house is guy heavy they need to talk Tom into voting out emmett. Kat instructs that they tell him the vote is tied and Suzette is going to vote to evict Emmett.. Talk moves to the girls saying they are tomboys. Great work Simon and Dawg. I’d like to encourage everyone to hit the donate button and show some OBB appreciation. Simon and Dawg do a lot for us and it doesn’t come for free. I really appreciate the support Thanks Chloe! 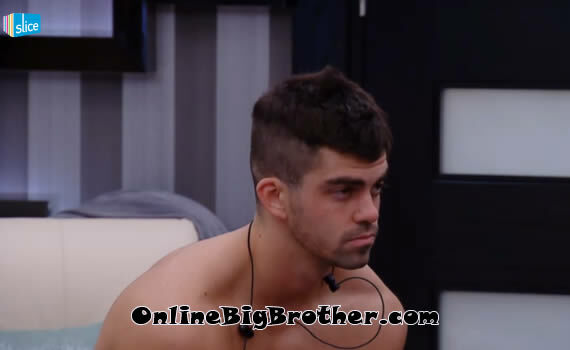 Big Brother Spoilers – Have you ever had s$x with a random person at your tanning salon?